After a brilliant London to Delhi flight and an unpleasant Delhi to Jodhpur flight we arrive to be greeted by our familiar faced driver! He’s ever so loopy but ‘usually’ manages to get us places in one piece!! When I first step off the plane I am always hit with the smell…. the smell of India…. then I know I’ve made it back to this fascinating country. The car journey is the next experience to remind me of what this crazy country is like… close encounter with a tuktuk swerving in front of us, near miss of a guy casually strolling across the super busy road, near hit of a bus stopped and half blocking our side of the road…. that list could go on and on! We arrive at the factory to a warm welcome from our long time good friend! It’s good to see him again, and looking so well! We have a little catch up and after a brief wander round we head to the hotel…. I love it here, at this hotel. 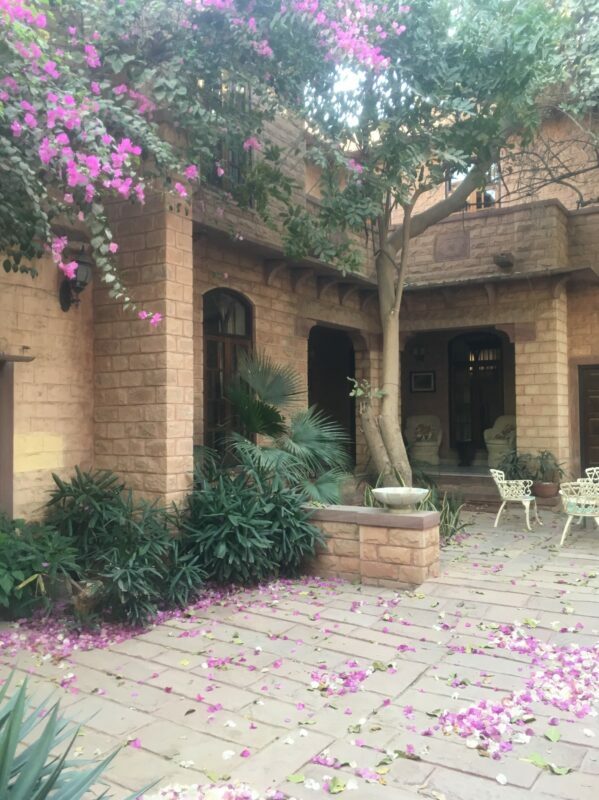 My favourite we’ve stayed at in India. The grounds are gorgeous with trees and flowers everywhere and I can hear plenty of birds singing and chipmunks too! Will have a quiet evening tonight, early dinner and a good nights sleep. Tomorrow I’ll be able to add some photos of all the gorgeous and unique furniture they have for us here. I’m looking forward to checking it all out!